RAN’s Chief of Navy Vice-Admiral Ray Griggs (left) and RSN’s Chief of Navy Rear-Admiral Ng Chee Peng (right) at the signing the Submarine Rescue Arrangement on board the RSN’s submarine rescue and support vessel, MV Swift Rescue. SINGAPORE – The Republic of Singapore Navy (RSN)’s Chief of Navy Rear-Admiral Ng Chee Peng signed the Submarine Rescue Arrangement with Royal Australian Navy (RAN)’s Chief of Navy Vice-Admiral Ray Griggs earlier today. The agreement was signed on board the RSN’s submarine rescue and support vessel, MV Swift Rescue. The Submarine Rescue Arrangement establishes a framework between the RSN and RAN in the area of submarine rescue support and cooperation. Under the arrangement, the RSN will make available to the RAN MV Swift Rescue and other resources to render support and assistance in the event of an RAN submarine incident. 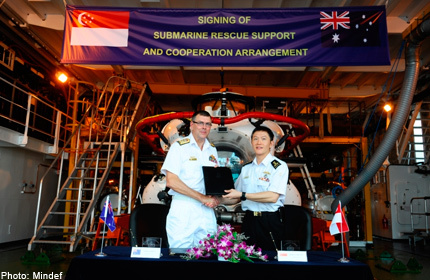 The Ministry of Defence said that the Submarine Rescue Arrangement reaffirms the close and long-standing bilateral defence relationship between Singapore and Australia, where both armed forces interact frequently through exercises, visits, professional exchanges and military courses. This entry was posted in The world's submarines and tagged Australia, RAN, RAN MV Swift Rescue, RSN, Singapore, Submarine on May 15, 2013 by jasonlockley.